The Ping-Pong lover could finally fulfill his dream. To play. The picture lies a bit, he is not as good as it seems. The dinky and kind of cheap looking cake was actually pretty good. Chocolate. I have to admit I copied the style little. Happy b-day Dominik!! Three already, they grow so fast! Chocolate cake is a must at our birthday parties, yours looks yumi. 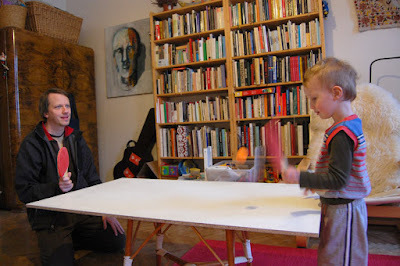 I have to remember the ping pong table as a future present, its a great idea. Homemade cakes are always the best!!! Happy birthday Dominik! My boys have been saving up for an outdoor ping-pong table for almost a year now, such a fun game (we borrowed one for a while a few years back)! The cake looks great, Magda, it must have been a good celebration. 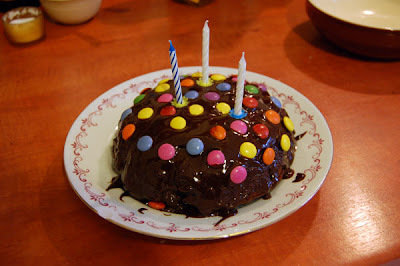 happy birthday to Domik, the cake looks great, not cheap at all! 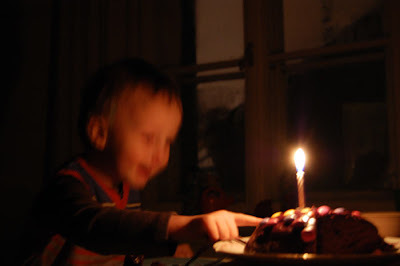 I am quite certain he loved the cake...what child would not? It is so cute. I loved playing ping-pong as a child. It was one of the first things my parents bought for us when we got our first house in Canada. Happy belated birthday Domik :)!